Home » Rev Up Your Engines: Bulletproof Coffee is Here! Rev Up Your Engines: Bulletproof Coffee is Here! Finding the “right” coffee is an endless quest for most of us connoisseurs. We are always looking for that next perfect blend or bean. No matter how many cups of coffee you have, there will forever be that one brew that blows our minds. It’s what makes coffee such an amazing drink! No two cups are ever alike, and it’s a brand new revelation each time. If you want a brand of coffee that will deliver quality and flavor with every cup, you may want to consider Bulletproof Coffee. It’s a unique product, especially because it is part of a trendy new “breakfast replacement” bulletproof diet. In short, combined with grass fed unsalted butter + mct oil, it supposedly is a good meal replacement. To be clear, I am evaluating Bulletproof coffee as a brand of coffee NOT as a diet replacement. Bulletproof Coffee is a 100% Arabica grown at high altitude on single estates. It is harvested and processed with maximum care, packaged with special protection to reduce the mold toxins that steal flavor and degrade the antioxidants from your coffee. All Bulletproof Coffee beans are tested to ensure it is as pure as possible, leading to a greater variety of taste and better delivery of caffeine. Bulletproof comes in both whole beans and ground coffee. Connoisseurs will want to buy the beans whole, as the in-the-moment grinding yields maximum freshness and flavor. But even the ground coffee delivers a quality taste that makes it a wonderful way to start your day in style. What makes this coffee special? The average coffee bean is either sun-dried or pressed and allowed to ferment to remove the outer layer of the bean. This increases the production of mycotoxins, which help to enhance the flavor. However, with Bulletproof coffee, the bean is immediately machine-processed after picking, using only cold, clean water. This helps to reduce mold and bacteria growth. The beans are then roasted in small batches (by a top-ranked American roaster) to bring out the flavors and increase the antioxidant content of the beans. The result: a healthier, more well-balanced brew with every cup. The brand Bulletproof Coffee was created in response to the popular “bulletproof coffee” drink. This drink is an odd combination of black coffee, unsalted butter, and MCT coconut oil. It’s meant to be an energy-boosting, performance-enhancing version of coffee, and became highly popular in the early 2010s. Cleaner caffeinating – The fact that there are no mycotoxins in this coffee means that there is less stress on your immune system. The lack of mold and bacteria makes the coffee “gentler” on your body. It may sap some of the flavor, but it ensures you are healthier no matter how much coffee you drink. There is no “crash” after drinking this coffee! High-quality control – As described above, the coffee goes through a strict process of growth, harvesting, processing, and roasting. The quality control of this coffee is top notch, and you can be sure you’re drinking the freshest, best-tasting cup of coffee these Guatemalan Arabica beans can produce. Bright flavors – Looking for a coffee with a bit of brightness? This brew delivers fresh flavors rather than the deep, rich flavors you’ve come to associate with most coffee. You get hints of apples, vanilla, and cherries, with a creamy caramel finish. If you’re a connoisseur who wants to get the most out of your coffee, it’s a good option to consider. Pricey — At about $20 for a 12-ounce bag (check here for latest), this is a fairly pricey product. You will find gourmet coffee brands at the same or higher price, so it’s definitely not going to be the most you’ll pay for a cup of coffee. But it’s not a budget-friendly option, to say the least. Lacking complexity – Let’s get one thing clear: this is not the most complex brew around. Mycotoxins help to add flavor and depth to your brew, so you can’t expect to have the typical richness you get from coffee. For those who suffer from the negative effects of these mycotoxins, this is a good brew. But for anyone who wants complex flavors aren’t affected by the mold, it’s a brew that lacks complexity. Requires more ground – If you have a coffee ground with rich, complex flavors, you can use less ground to make a single cup. Not so with this coffee. It will take anywhere from 125-150% of the coffee ground you’d need a higher quality coffee to make a single flavorful cup. You’ll end up going through this bag faster than you would with another more complex brew. 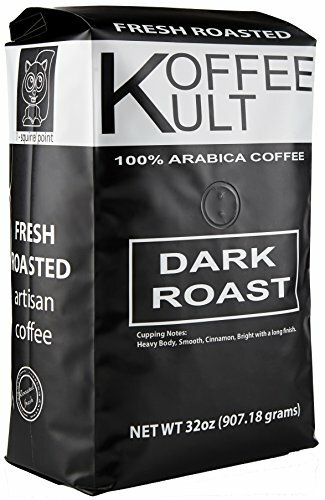 Koffee Kult Dark Roast Coffee Beans – This 100% Arabica has much more complexity and richness than the Bulletproof Coffee, and you get far more (2.3 pounds) for pretty much the same price ($24). It’s a blend of Arabica beans from Colombia, Sumatra, and Guatemala, and is organically sourced, fair trade, and brews one heck of a cup of coffee. You’ll find it’s heavy, smooth, and has notes of cinnamon with a bright, long finish. Best of all, the beans are roasted in the USA to meet US Food standards. Quality at a great price! 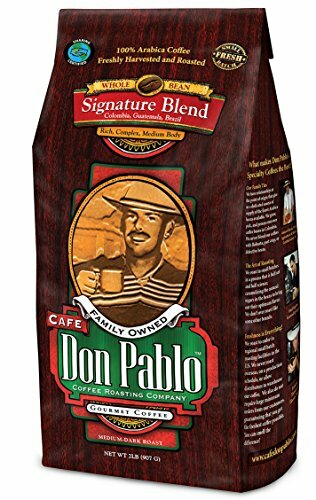 Cafe Don Pablo Gourmet Coffee Signature Blend – This medium-dark roast blend is made with beans from Brazil, Guatemala, and Colombia, and you’ll find it has a rich, intense flavor that is beautifully sweet and aromatic. The tasting notes are predominantly milk chocolate, ripe tomato, and cedar, with a wonderful balance that is smooth on the finish. It’s also 100% Arabica, and though it’s not fair trade or organically sourced, you can’t argue with the richness and aroma of the coffee. The 2-pound bag retails for just under $15—a great price! 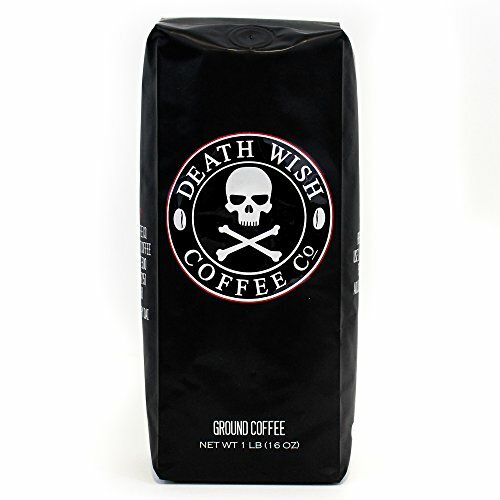 Death Wish Ground Coffee — If you’re the kind of coffee drinker who needs a harder kick out of their brew, it doesn’t get better than this: the World’s Strongest Coffee! The coffee is both fair trade and USDA-Certified Organic, and you’ll love the subtle notes of chocolate and cherry that you get with each sip. But the premium beans deliver bold flavors and four times the potency of a regular cup of coffee. Best of all, the potency is all-natural, with no added ingredients or flavorings. The high caffeine content makes it an excellent choice for anyone studying or working on a deadline. Bulletproof Coffee is the perfect option for those who are affected negatively by the mycotoxin mold that gives coffee its rich, complex flavors. It may lack the depth of regular commercial brews, but it will produce a cup of great coffee that is as “clean” and natural as possible. If you’re willing to pay a higher price for a free trade product, it’s an excellent investment in your brain function.